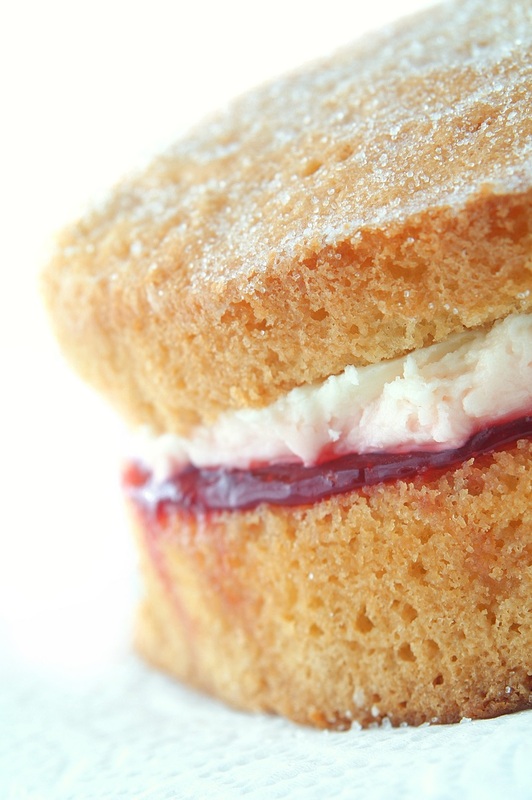 There’s nothing quite as quintessentially British as a slice of Victoria Sandwich with a cup of tea (preferably in the garden!). I use this classic all-in-one sponge mix all the time, in varying quantities, for both large and small cakes and it never goes wrong. The basic ingredient ratio for sponge is 4-4-4-2 (4oz flour, 4oz sugar, 4oz butter and 2 eggs which makes the perfect amount for 12 fairy cakes). This amount can easily be doubled (to 8-8-8-4) or increased by 1.5 which is the quantity I most often use( for a Victoria Sandwich (6-6-6-3). If you have 20cm cake tins use the 8-8-8-4 quantities below. If like me you have 18cm tins then use quantities of 6-6-6-3 and adjust your milk & baking powder accordingly. Divide mixture between the tins, smooth surface with a spatula or back of a spoon, then bake for about 20 mins until golden and the cake springs back when pressed. Turn onto a cooling rack and leave to cool completely. 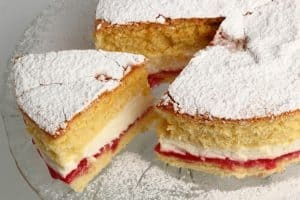 If you want to fill the Victoria sandwich with buttercream and jam (or lemon curd), beat 100g softened butter until smooth and creamy, then gradually beat in 140g icing sugar. You can add a drop or two of vanilla extract if required. Or for a special treat sandwich your cakes together with a pot of Whipping Cream and some fresh strawberries or other summer berries. And of course, a Victoria Sandwich just wouldn’t be complete without a liberal dredging of icing sugar all over the top. Yum yum – makes you proud to be British! !